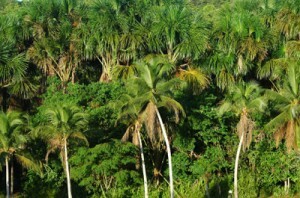 The Amazonian forests are estimated to be home to some 390 billion trees, and some 16,000 different tree species. The Amazon Basin includes bits of Peru, Brazil, the Guiana Shield and Columbia. However, it has recently been estimated* that 227 species make up half of these billions of trees. That is 1.4% of the total species count make up 50% of the trees. The 227 species identified as ‘hyper-dominants’ seem to have no obvious physical / special features (such as seed mass or wood density), and they range from shade tolerant climax species (with large seeds) to smaller seeded, shade-intolerant pioneer types (those that colonise clearings initially). It is probable that the features or characteristics than enable these hyper-dominants to flourish are associated with resistance to pathogens (fungi and bacteria) and particular herbivores (beetles, caterpillars, leaf cutters etc.). None of the hyper-dominants are common across the amazonian region; different ones dominant in swamp, upland forest etc. Some of the hyper-dominants have been used / cultivated in the Amazonian region - to provide, for example, brazil nuts, rubber and chocolate. 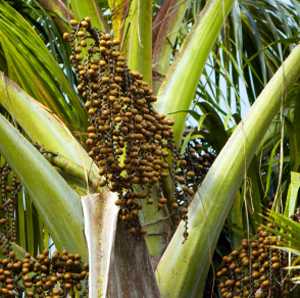 The most common species was a type of palm tree - Euterpe precatoria. This is native to South and Central America; its total population has been estimated at some 5 billion plants. It is related to the edible fruit – the acai, Euterpe olearacea. The acai is often referred to as a ‘superfruit’ because of its high anti-oxidant content. However, a recent paper in Food Chemistry by Jie Kang et al has indicated that E. precatoria has an even higher anti-oxidant and carotenoid content than E. oleracea. * Some 100 scientists / experts have contributed information / data from over one thousand surveys of forests in different parts of the Amazon to compile this 'picture'. For further details / information - visit Science Daily. I am not a woodlander or a scientist for that matter but these posts are fascinating.